Chelsea manager Jose Mourinho paid a huge compliment to promotion-chasing Walsall by labelling Dean Smith's Saddlers' playing style the best he has ever seen from any League One side. 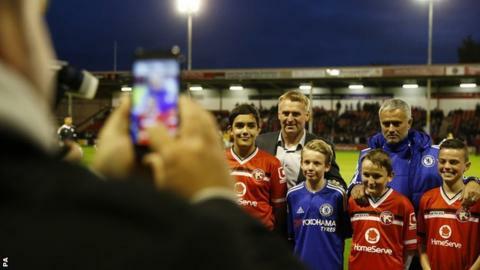 'I have years of cups in this country," Mourinho said after Tuesday night's 4-1 League Cup third round win at Bescot. "And I haven't found a team in League One playing the quality of football that Walsall tried to play. "I analysed them before. I watched a couple of their matches in League One." Long before Burnley's fans pinched the nickname for Sean Dyche, Walsall's supporters came up with 'The Ginger Mourinho' as a term of endearment for their Special One, Saddlers manager Dean Smith. At only 44, he is England professional football's fourth longest-serving boss, having been in office at the Banks's Stadium since January 2011 - beaten only by Arsene Wenger (19 years next week), Exeter City's Paul Tisdale (June 2006) and MK Dons' Karl Robinson (May 2010). Mourinho, two years and 113 days into his second spell at Chelsea, is 26th on that list. Mourinho added: "I was surprised with the quality of their play. They are a different team to normal in League One - not so physical, but technically fast. They were very well organised. "I am always worried against teams with great belief. After 3-1 we could feel like it was game over but before that everything was open. They created chances and fought hard." Smith, gratified by Mourinho's magnanimous words, had already been flattered by the side that the Chelsea manager picked to ensure the holders got the job done in the Black Country. "They put a really strong team out," he told BBC WM. "They respected us and the competition. I'm really pleased for my players, because they will have learnt an awful lot. They were playing against some world class players. It was a great experience for them and will help them get better." Walsall, second in League One, face the other end of soccer's spectrum on Saturday when they host Crewe, who are second from bottom.